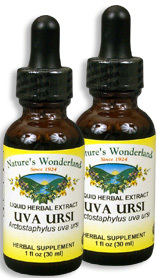 Uva Ursi Extract, 1 fl oz / 30 ml each (Nature's Wonderland) - Penn Herb Co. Ltd.
Herbalists value Uva Ursi as an effective urinary antiseptic that helps to flush the kidneys and urinary tract clean. Its natural compounds go to work immediately on all parts of the urinary system to soothe discomforts. Herbalist Hint: Maximize Uva Ursi’s cleansing action by taking it with Cranberry Juice or Oregano Oil, while avoiding acidic foods and drinks. COMMON NAMES: Bearberry, Kinnikinnick, Mountain Cranberry, Upland Cranberry. AMOUNT PER SERVING (333mg/ml or 30 drops): Ethically Wild Harvested Uva Ursi Leaf (Arctostaphylus uva ursi). OTHER INGREDIENTS: Grain Alcohol (40-50% by volume), Deionized Water. Free of: milk, dairy, egg, fish, shellfish, tree nuts, peanuts, wheat, gluten or soy. Supports healthy urinary tract; promotes bladder health; supports bladder muscles; supports healthy kidney function; soothes urinary & bladder discomforts; cleanses and tones urinary passage; increases urine flow; supports prostate health. 30-60 drops in water or juice, 2-3 times daily or as needed. DO NOT TAKE DURING PREGNANCY.